Review Media streamers are all too often the jack of all trades yet the masters of none. Thankfully, no such blight tarnishes the Logitech Squeezebox Duet's shiny black carapace. The first product to come from the Slim Devices team since its purchase by Logitech in 2007, the Duet has been developed to do one thing: stream music content from a computer to a hi-fi and do it well. The Duet comes in two parts. The receiver is a small black unit that takes the incoming wireless signal and pumps it out through a 24-bit Wolfson digital-to-analogue convertor (DAC) to your hi-fi through the supplied RCA cable – or you can bypass the DAC and use the optical and coaxial digital outputs. The controller lets you choose what to play, mediating the actions of the receiver and the SqueezeCentre 7 media server software running on your PC, Mac or Linux box. 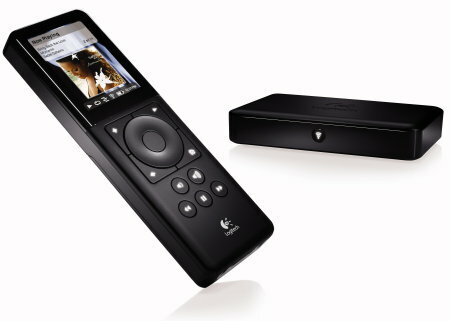 Essentially, Logitech's taken the screen off a Squeezebox 3 and integrated it into the remote instead. The receiver is a rather hum-drum looking device, but as it'll be tucked away behind the stereo, who really cares? The controller, on the other hand, is rather swish. At 150 x 50 x 18mm, it isn't exactly small but it is perfectly sized to do the job demanded of it, namely to navigate through your music library, play your tunes and adjust the volume. The controller is powered by a rechargeable battery and comes with an equally well made metal stand/charger that shouldn't look out of place alongside even the most high-end of audio kit. Once up and running, the controller is a lovely little thing to use. To start with, the 2.4in screen is both bright and clear, making album art and text very easy to see. Logitech has got the text sizes just right: it's easy to read but not so large you're forever scrolling up or down in the quest for more information. The standard Now Playing screen manages to squeeze in the title, artist, band/orchestra, composer, genre, year and artwork before you have to scroll down for such technical data as file format, bitrate, ID3 Tag version and the like.